The Glencoe Lions and donor Van Heck Funeral Home have directly funded students from Ekcoe Central School and St. Charles School. 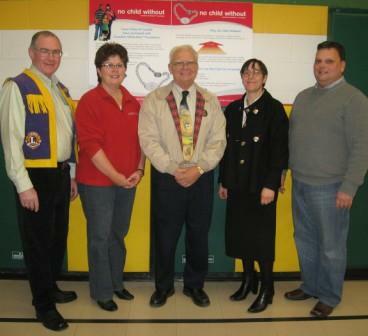 The Sarnia Township Lions Club has directly funded students from the Confederation Central Elementary School. Involved in the Sarnia Township Lions Club MedicAlert program for Confederation school are from left to right Lions Club President Koert Nieuwenhuis, soon to be recipients of MedicAlert bracelets Jimmie Toyne and Brody Lapointe and Lion Al Taylor, Chair, Boys & Girls Committee. Picture taken by Lion Joyce Doucet, Bingo Chair.